Showcasing traditional styling, this one-story house plan delivers an all American look with its front facing gables and brick façade. Inside, you’ll find a floor plan designed to offer functional family living with its practical layout and features. 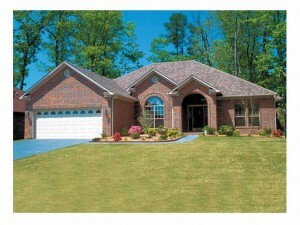 Stepping in from the covered front porch, the foyer quickly introduces the dining room and great room. The open and spacious gathering areas deliver a warm and inviting feel your guests will immediately notice, while the 10’ and 11’ ceilings create a sense of grandness. A unique layout reveals the hearth room at the back of the home mirroring the great room. This space offers a more casual gathering area while the great room handles formal affairs and special occasions. A pass-thru fireplace warms both gathering spaces. Serving breakfast to the kids before school or a snack after classes is a snap with the eating bar enhancing the step-saver kitchen. Multi-tasking and unloading groceries are a breeze with the laundry room and 2-car garage situated near the kitchen. You can easily prepare dinner while you wash clothes for work tomorrow and deliver groceries to the kitchen without leaving the kids in the unattended in the hearth room for too long. Split bedrooms afford privacy to your well appointed master suite. Notice the elegant 10’ box ceiling and pocket door access to the deluxe master bath sporting a whirlpool tub, separate shower, double bowl vanity and compartmented toilet. A huge walk-in closet completes this space. Across the home, two family bedrooms share a full bath. Filled with all the things you’re hoping for, this traditional house plan is second to none! Browse more traditional house plans like this one.